http://www.JewishWorldReview.com | US President Barack Obama's warm endorsement of the plan to build a mosque by the ruins of the World Trade Center tells Israel - and its enemies - everything we need to know about the president of the United States of America. In his words, "As a citizen, and as president, I believe that Muslims have the same right to practice their religion as everyone else in this country. And that includes the right to build a place of worship and a community center on private property in Lower Manhattan, in accordance with local laws and ordinances. This is America. Our commitment to religious freedom must be unshakable. The principle that people of all faiths are welcome in this country and that they will not be treated differently by their government is essential to who we are. The writ of the Founders must endure." Of course, none of those who have voiced opposition to the mosque project at Ground Zero have claimed that the Islamic group behind the mosque project is acting unlawfully in seeking to construct a mosque. The nearly 70 percent of Americans who oppose building a mosque at Ground Zero oppose the mosque because they believe it is wrong to build a mosque at the site where less than a decade ago Muslims acting in the name of Islam murdered nearly 3,000 people in an act of war against the US and an act of terror against the American people. Obama has been pilloried by his opponents for his position. And his fellow Democrats, facing the likelihood of massive defeats in the Congressional elections in three months, are reportedly deeply frustrated by his statements. Indeed, the uproar Obama's pro-mosque remarks has unleashed has been so harsh it raises the question of why he made it. THERE ARE two possible explanations for Obama's move. Either he was motivated by politics or he was motivated by ideology. The view that Obama was motivated by politics is easily dismissed. With more than two-thirds of Americans telling pollsters they oppose the Ground Zero mosque project, it makes no political sense for a politician to strike out a position in favor of the mosque. Indeed, major Democrats have either refused to state a position on the issue or, like New York Governor David Paterson, they have recommended that the mosque builders construct their mosque elsewhere. Perhaps Obama thought he could he could get away with making his statement. However, with his polling numbers consistently eroding, it is hard to imagine Obama's advisers would have told him that was a realistic view. This leaves ideology. But what ideology motivates Obama to embrace such an unpopular initiative at such an explosive political juncture? Obama and his supporters would like us to believe this is a civil rights issue. 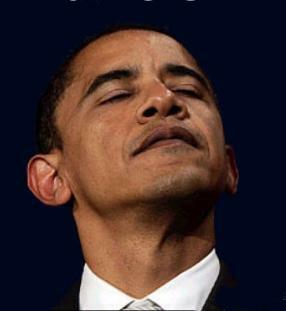 In his defense of the Ground Zero mosque, Obama claimed his position was based on the American values such as, "The laws that we apply without regard to race, or religion, or wealth, or status. Our capacity to show not merely tolerance, but respect towards those who are different from us." But if Obama is motivated by a belief in civil rights that is so strong it propels him to take on deeply unpopular causes in an election season, then one could reasonably expect that his support for civil rights would be absolute. That is, one could expect him to use the same yardstick for all groups, in all places and at all times. At the same time, Obama has insisted that Israel take no action to enforce its "local laws and ordinances" against illegal structures built by Arabs in Jerusalem, Judea, or Samaria. Next month the deeply discriminatory and legally dubious 10-month moratorium on Jewish building in Judea and Samaria that Obama coerced Prime Minister Binyamin Netanyahu into instituting is set to end. So now Obama is putting the full weight of the White House on Israel to again coerce Netanyahu into prolonging the discriminatory ban that denies the civil rights and property rights of Jews simply because they are Jewish. Obama claims to be embracing the nullification of Jewish civil right in the interests of peace. In his stated view, to forge peace in the Middle East it is necessary for the Palestinians to achieve statehood. But it hard to see how the establishment of a Palestinian state squares with Obama's purported dedication to civil rights. In a briefing with the Egyptian media last week Palestinian leader Mahmoud Abbas told reporters that no Jews will be allowed to live in a future Palestinian state. He also said that while he would agree to allow NATO forces to deploy in the future Palestinian state, he would not permit any Jewish soldiers to serve in the NATO units stationed on the territory of such a state. As he put it, "I will not agree that there will be Jews among NATO forces and I will not allow even one Israeli to live amongst us on the Palestinian soil." The notion that an inherently anti-Semitic Palestinian state, predicated on Jew hatred that strong, could possibly live at peace with Israel is simply ridiculous. But tellingly, in all the American pressure that has been placed on Abbas to begin direct negotiations with Israel, at no time has the administration been reported to have insisted that Abbas abandon his anti-Semitism. Obama has made no statement addressing the fact that the Palestinians demand that Jews be barred from living in the future Palestinian state. He has certainly not objected to this position although it squares with none of the American values of tolerance and property rights he upheld so strongly in his remarks on the Ground Zero mosque. SO THE ideology Obama holds so strongly that it provokes him to take positions antithetical to the political interests of his party during an election season is not civil rights. Rather it has to do with his commitment to advancing the interests of a specific group or groups over the interests of other specific groups. In the case of the Ground Zero mosque he prefers the rights of Muslims over the values of the overwhelming majority of Americans. In the case of the Palestinians, he prefers their anti-Semitic nationalism over the civil rights of Jews. Obama's behavior tells Israel's leaders something very important about how they should think about their relations with the Obama administration. It tells them that Obama is so wed to his ideology that he will push it regardless of political conditions. This means that for Israel, dealing with Obama is like standing on a landmine. Just as a landmine can explode at any minute, Obama can attack Israel at any moment. He is so ideologically bound to the Palestinian cause against Israel that he is liable to provoke a crisis when it is least politically advantageous - from his perspective - for him to do so. This lesson is particularly urgent on the eve of yet another round of direct negotiations with the Palestinians and as the freeze on Jewish property rights is about to expire. Obama's ideological fanaticism means that nothing Israel does in the upcoming talks will help us. As Obama's media surrogates like Tony Karon at Time magazine have made clear in recent weeks, the anti-Israel narrative has already coalesced. Everything that happens regarding those negotiations is Israel's fault. It is Israel's fault that they haven't begun. It will be Israel's fault when they falter. It will be Israel's fault when they fail. And if they succeed, Israel will still be blameworthy. Facing this US President and his radical ideology, Netanyahu and his deputies must understand that they cannot appease him. They cannot convince him of Israel's good intentions. The US leader who has rejected the expressed views of 68 percent of his fellow citizens in favor of the construction of a mosque at Ground Zero is not going to be moved by reason. The American president who defends the Ground Zero mosque builders even though their leader refuses to acknowledge that Hamas is a terrorist organization and has claimed that the US had the Sept. 11 attacks coming to it; and the American president who upholds the Palestinian cause even though it is virulently, and often genocidally anti-Semitic is not going to be appeased by Israeli building freezes and other confidence building gestures. What this means is that Netanyahu and his deputies must concentrate on defending Israel and advancing its national interests. It is in Israel's national interests to guarantee the civil rights and property rights of Jews. It is in Israel's national interests to forthrightly set out and defend Israel's legal rights in Judea and Samaria and its sovereignty in united Jerusalem. It is in Israel's national interest to enforce its laws without prejudice towards all its citizens and expect all its citizens to respect its laws. We are dealing with a self-consciously radical President who intends to remake the US relationship with the Muslim world. We will find no understanding from him.